It's time for another challenge over @ 613 Avenue Create & this week our optional theme is Anything Goes. I've admired these fancy fold center step cards for a while now but was too afraid to try them....I conquered my fear with this creation & I must say that I'm quite pleased with it. I will definitely make a few more of them for Christmas! To see what the rest of the Design Team created & to read up on our rules; please head over to our blog. I'm looking forward to seeing your wonderful work this week....have fun & happy stamping everyone!!! Very pretty center step card. Fab image and great colour scheme too. I love centre stepper cards & yours is so vibrant thanks for joining in with us at polkadoodles. What a sweet blue and white design - these colors add to the beautiful wintery feel of your card! I like how you arranged those flowers - so decorative! Such a cute image & a sweet card! 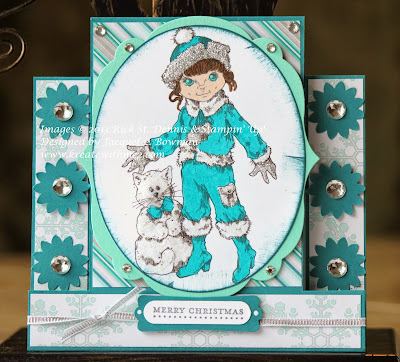 Thanks for sharing with us in our Winter Blues Challenge at The Crafting Cafe this time! Great card, I love stepper cards. The color you used is wonderful. Glad you joined us at Sweet Stampin' this week. Beautiful. I love the colours & the way you framed the image. Vivid colouring, and perfect for Winter Blues. Thanks for joining us at The Crafting Cafe, and good luck!